Of course, you want the best for your four-legged family members, and the best hypoallergenic dog food may be the best option for them in the long-run as some independent studies have shown. Even if you’re thinking “well, I don’t think Fido is allergic to anything we feed him,” it still may be worth looking into the benefits of a hypoallergenic diet for dogs because there are many benefits to this type of dog diet. Why Buy Hypoallergenic Dog Food? Helps stop unusual and uncomfortable reactions: if your dog is prone to ear infections, frequent year-round itching, sneeze-attacks, vomiting, or other stomach issues they may be intolerant or allergic to something in their food. Purchasing hypoallergenic foods reduce the risk of these uncomfortable symptoms from plaguing your dog any further. May help prevent reactions: even if your dog doesn’t display any of the symptoms mentioned above or coughing, sneezing, or wheezing, they may still develop an intolerance or a reaction to proteins and ingredients that they’re frequently exposed to. Saves time: the best dog food for dogs with allergies or intolerances are the home-made variety. However, making dog food from scratch is not only time-consuming, but also very inconvenient as it has to be stored in the refrigerator or prepared daily, and the storing of ingredients until you’re ready to use them can also be a pain. By purchasing hypoallergenic dog food instead of making it you’re saving yourself a ton of space and time. Real ingredients: the vast majority of non-hypoallergenic dog food on the market contains fillers, byproducts, and unnatural ingredients for dogs to consume. Most hypoallergenic dog foods have all real ingredients (like names you can actually pronounce) and often limited ingredients as well, which is often easier for digestion. Limited ingredients: limited ingredient dog food offers, well, a limited number of ingredients. With fewer ingredients in the mix it will not only lessen the likelihood of your dog having an allergic reaction but if Fido still does, at least you can narrow down the problem ingredients. Novel ingredients: novel ingredient dog food includes new types of ingredients that most dogs aren’t exposed to. Often times this includes proteins that may seem strange like kangaroo or bison meat. Prescription food: prescription dog food is specially created for dogs (or any animal, really) with serious and potentially life-threatening issues such as obesity, excessive paw licking, severe digestive issues, or serious allergies to food. They’re highly researched, backed by science, and often a very pricey option that is out of the question for the average pet owner. Real ingredients: as I’ve discussed a lot already (and more to come) real ingredients are key to health, animal or otherwise. Avoid products that don’t list real meat as their top 3 ingredients. Try to avoid byproducts or meals whenever possible. If that’s not an option within your budget, you can always attempt to limit the amount of meal or byproduct. The lower on the list, the less of it is used, so try to ensure the top three are at least real meat. Find the best match – Regardless of the breed of your dog or the type of intolerance they have there is nearly always a type of dog food out there to suit them so always look for the most suitable food for your dog. If you have a Pitbull for example then look for dog food that is specifically produced for Pitbulls. If you’re unsure if or what your dog has an intolerance to, these are some tips to help you find the best hypoallergenic dog food for your pet. Unusual or limited ingredients: as we discussed, there are usually two types of hypoallergenic dog food; limited ingredient or unusual ingredient. If you’re unsure which, ingredients your dog is allergic to it may be best to stay towards the unusual ingredient side as they’re never or rarely been exposed to the ingredients in the food they’re unlikely to have an allegoric reaction. However, if you’re putting your dog on a diet just to be on the safe side and you’re not sure if they’re even allergic to anything at all, then limited ingredient dog food should work just fine. Intolerance or allergy: there are several subtle differences between an intolerance and an allergy. An allergy causes the immune system to go into a state of “high alert” and start attacking the foreign body (which isn’t usually all that unusual of an ingredient.) Intolerance, however, is generally limited to digestive issues due to the body’s inability to tolerate the presence of the ingredient. However, either one of these can become severe, and if you question your dog’s health, you should certainly see a vet make sure everything is okay. Accessibility: if the you find that the best dog food for allergies is out of your budget or hard to find in stores or online it will be hard to keep your dog on the food, and it will be essentially useless to both of you. Be sure to carefully consider how much you can regularly afford, how often, and where you can find it. Luckily enough Amazon does have a Save and Subscribe option for many types of dog food so you shouldn’t even have to leave your house if you decide to go that route. Real food: I know this has hit the list a few times thus far, but it’s worth mentioning again because it’s just that imperative. Meal and byproduct are harder to digest for dogs, and the same is true for wheat, soy, corn, and grains in general. Avoiding all of these very common allergens is a good idea, especially if an allergy or intolerance has been confirmed by your veterinarian. Additionally, egg, dairy, and additives that aren’t natural (such as color or flavor) are also not the best options for your pup. Antioxidants help protect your dog, like humans, against free radicals that could damage their immune system. It comes packed with easy to digest protein for usual sources (which is good in allergy or intolerance prevention and treatment.) 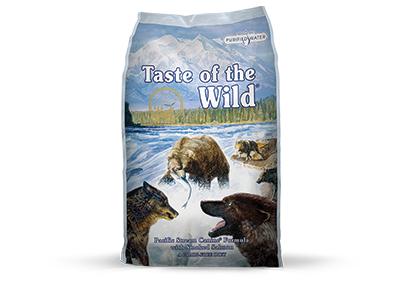 It’s also grain-free which makes it easier for dogs of all ages to digest with ease. Not only is this dog food hypoallergenic, but it’s also easy to digest, made with real ingredients, and developed to support their immune system. It’s also a good option regardless of your dog’s age. Meal is one of the first three ingredients. However, it is lamb meal, so your dog is less likely to have an adverse reaction to it as, say, corn meal. There are also no grains or byproducts, which, as we discussed are not good for dogs. 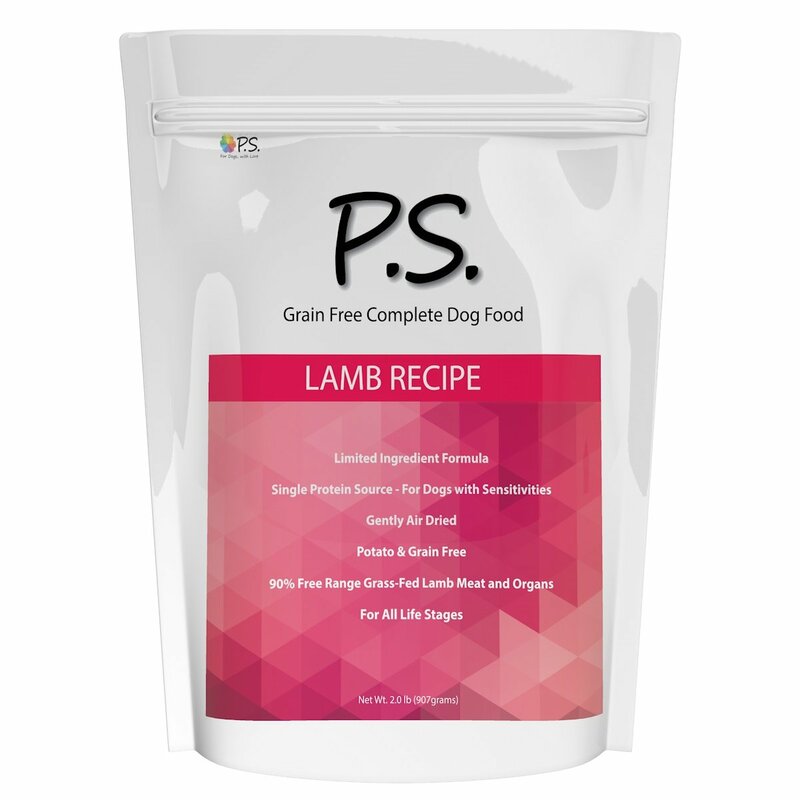 PS for dogs has some extreme methods for food production that creates some extreme results for serious intolerances or allergies to most common pet foods. P.S.’ low glycemic dog food prevents a build-up or overproduction of yeast in your dog’s paws, which is the most common cause of overly licking of the paws. Their formula is also low-ingredient, which resolves the vast majority of skin issues with dogs such as itchiness, dryness, flakiness, and red bumps or rashes. It’s a great option for dogs who have serious skin issues, allergies, intolerances, or even a paw licking issue (which can get quite bad) without the need for medication or prescription foods, which are often incredibly expensive and don’t solve the problem necessarily. The bags are only 2 lbs., which is quite small. However, you can order them as a save and subscribe item on Amazon and get them auto-delivered to your door, even at a discounted price! They can also be used as treats instead of as a food staple for your dog’s diet. Omega-6 fatty helps your dog’s skin and coat from drying out, while Omega-3 fatty acids are great for joint health and mobility. There are no products in here that are likely to cause your dog to have a reaction such as artificial colors, corn, wheat, soy, or poultry byproduct meal. The unusual ingredients used to make Purina’s Focus should help your dog avoid any allergic reactions or intolerances typically associated with commonly fed foods. They also made sure to leave out any common allergens for your dog like artificial colors, corn, wheat, soy, or poultry meal. It’s a little pricier than some of the other items on this list initially, but the bag is larger than a lot of the other bags on this list. On the plus size, you can save additional money by purchasing this bag throughout subscribe and save. The limited ingredient diet makes this food easier for dogs with sensitivities to digest. It also includes no common allergens that are common to dogs such as eggs, dairy, gluten, or artificial colors or flavors. The singular protein also makes digestion easier on your dog. It’s also made entirely in the USA if contamination or recalls from other countries are a concern for you. The aforementioned option is fantastic for those who have sensitive stomachs and is arguably the best dog food for skin allergies because of its limited list of ingredients making it a highly digestible source of nutrients for your pet. In having this as an advantage, your pup can digest this food well without tummy troubles on top of being hypoallergenic. One disadvantage as that this formula doesn’t come in a puppy formula. However, once your puppy grows up you can always transition them onto this formula within 7 – 10 days if you decide that this is the option for you. The ease of digestion is, of course, a crucial feature that this food offers. In addition, it offers key vitamins and nutrients in order to enhance and protect your dog’s skin and coat. The natural ingredients ensure that you’re only feeding your dog the best. Also, the lack of artificial additives ensures that you’re only feeding your dog real food while ensuring they’re less likely to develop (or continue to have) allergies. You can feed this food to your dog and rest assured that they won’t have any adverse reactions to it, it will be good for them, and easy for them to digest. They do not offer this formula is only intended for adult dogs, and not puppies. They don’t appear to offer it in a puppy formula, but if this is the option you think will work best for you and your dog, you can always switch them to this formula when they’re old enough. Even though every hypoallergenic dog food on this list is here for good reason (because they’re the best in my opinion) there is only one dog food on this list that can take top place. That winner would be Wellness Simple Natural, rated as the best grain free dog food for skin allergies because they’re highly affordable, easy to access, easy to digest, and offer a host of other fantastic benefits for your dog! 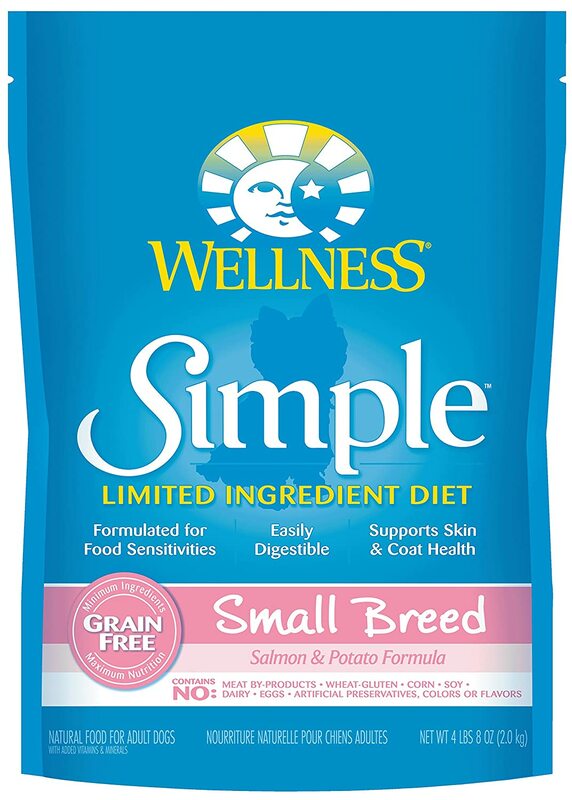 If your dog has been suffering from skin allergies or even just mild irritation then it is definitely worth looking at Wellness Simple natural, especially now that we have rated it as the best hypoallergenic dog food. It is still worth looking at a hypoallergenic diet for dogs who don’t suffer from any allergies or skin conditions simply because there are so many benefits to be gained from hypoallergenic dog foods thanks to the simple and high quality way in which they are produced.